We’ve had the joy of having our son Nathan visiting for the summer. His dream was to visit Rio de Janeiro so we planned to spend a day there after the World Cup tourist traffic died down. 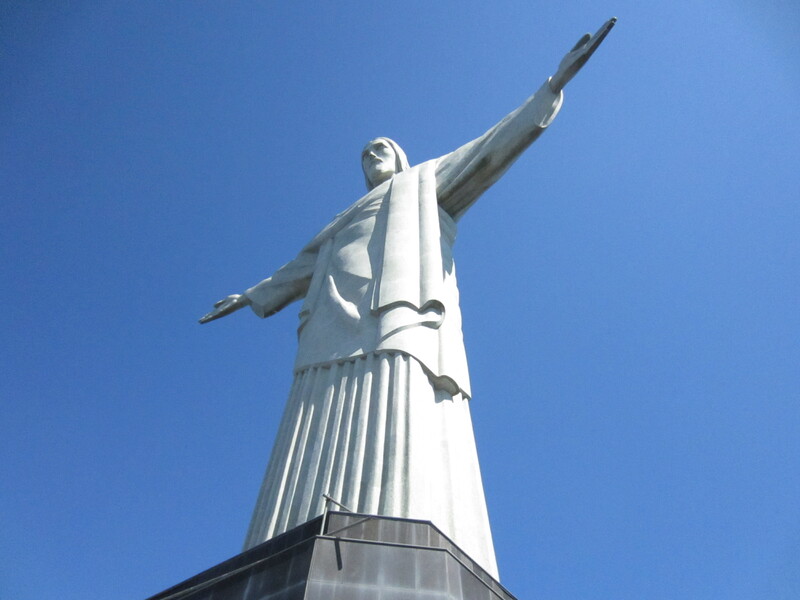 Among our list of stops was Christ Redeemer statue, the most visited sight in the city. After waiting in line an hour to board the trolley, we inched our way up to the top of the mountain. Descending from the tram car, we headed up a circular stone staircase and suddenly were at the base of the enormous (2,300 feet tall) “Cristo Redentor.” We were a bit confused by all the bodies lying around until we realized that people had to lie flat on their backs to be able to photograph the full vertical view of the statue. It occurred to me that I was getting a glimpse of a future reality. But instead of being on our backs with cameras, we’ll be on our faces before Him when every living being will be prostrate before Christ in worship. Romans 14:11 reminds us that someday we’ll be before the judgement seat of God and His holy presence will be so compelling that “every knee shall bow and every tongue acknowledge” Him. Whether you believed in Him or not for salvation, it won’t matter. EVERY living creature will recognize Him for who He is. Some with fear and others with joy. before that awful day. I pray for all those who linger in unbelief, in such a dangerous position! What a good word. Thank you, and I do pray for God to lead you to let many more know of his love. Wow! What an awesome sight! How much more awesome to see the Living Lord himself, Christ MY Redeemer!